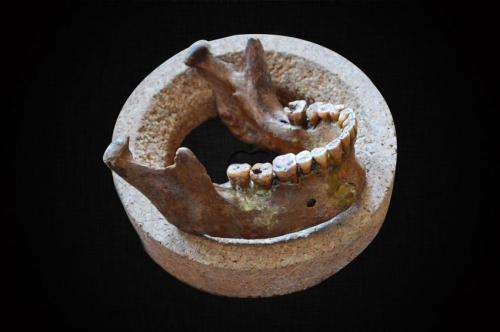 Hunter-gatherers had almost no malocclusion and dental crowding, and the condition first became common among the world's earliest farmers some 12,000 years ago in Southwest Asia, according to findings published today in the journal PLOS ONE. the reason is probably simple, hunter gatherers had to chew their food more as non-domesticated crops and food sources, particularly leafy and root plants required more mastication than domesticated crops did. also, the processing of crops probably became more standardized so that less chewy parts of the plant were eaten while the toughest parts discarded. hunter gatherers probably used their mandibles and jaws a lot more thus keeping their bones and teeth under more regular pressure and use. consider what happesn to rodents that don't use their teeth sufficiently. Would it not be correct to interpret this information as part of the Neoteny rebuild of the new humans transiting out of Africa to the Levant? A slightly irrelevant thought: I wonder, if we figured out a way to intervene, to cause our children's jaws to grow to a more massive size, to accommodate all our teeth, would we do so? Despite my need for orthodontia, I like my jaw size as is. Doesn't need to be "massive," just a little bit bigger. Perhaps children should be encouraged to chew gum to exercise their jaws?